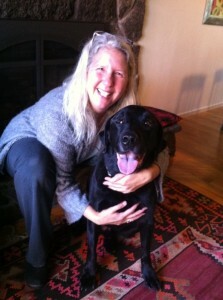 This is my dog Poncho and his new Vet Dr. Cynthia Steele, whom we both love. He has lumps and bumps and not as much energy as he used to have. Recently he has developed a strange problem with his eye. I hadn’t been happy with my current vet and I needed to find a new one. I was not looking forward to taking my 11 year old dog to a new Veterinarian office. I was afraid they were going to over prescribe treatment for him. Also, Poncho is not a big fan of going to the vet, he gets very stressed & doesn’t like to sit still. It usually takes 2 or 3 of us to hold him in place for an exam. Someone suggested we try a mobile vet. I had no idea mobile vets existed. A mobile vet is a doctor who does house calls. They come to your house to examine your dog. Way less stressful for you and your dog. I wasn’t sure what to expect from the mobile vet I called but what I got was an awesome vet! Cynthia and Maureen (nurse) showed up at my door and greeted me with a hug. Poncho instantly loved them. He thought friends came to visit just him. They spent a whole hour examining Poncho and talking with us about his health. The cost of the visit was only slightly more than a trip to the vet but the quality and care was 100 times better. If you have an older dog or would rather have your vet come to your house instead of sitting in a stressful waiting room with a bunch of other sick pets I highly recommend calling Mill Valley Mobile Vet. Since she is mobile you don’t have to live in Mill Valley to use her services. She goes all over Marin and I think even to the city sometimes. We are lucky…our vet will make housecalls if HP is not up to going. He has Evans Syndrome (started with his pupil filling up with blood). He contracted it like 3 years ago. I love our Vet, I think that we would have lost HP back then if it was not for his team. Glad you found someone you like that cares about your baby as much as you do. I wondered what happened to her. The clinic where she used to be isn’t the same without her. Thanks for sharing this info Sally. In the 1970’s I don’t think they had mobile vets so when a dog was dying from convulsions on the property the dog pound would come and god only knows what they did with my dog. It really has never settled well with me what my mother did that day. Love that! I might try it. Hope Poncho is getting relief.